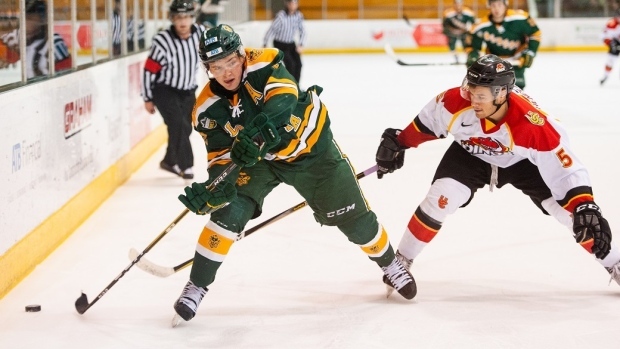 The Calgary Flames signed University of Alberta forward Luke Philp to a two-year entry-level contract on Tuesday afternoon. Philp had 21 goals and 45 points in 24 games with the Golden Bears this season. TSN Hockey Insider Bob McKenzie notes that Philp suffered a lower-body injury that took him out of the U SPORTS University Cup over the weekend and is expected to be sidelined for four weeks. The 23-year-old won the Senator Joseph A. Sullivan Trophy as the U SPORTS Player of the Year this season. "Winning the Canada West scoring title two years in a row, especially this year when he missed four games due to injury, and still scored 21 goals, speaks for itself," Alberta head coach Ian Herbers said in a statement after the award was announced last week. "Luke is an excellent leader on our team and a clutch performer. He has produced in all situations, and been the most reliable and consistent player in the conference this season." Philp spent five seasons in the WHL before joining the Golden Bears in 2016. He had a career-high 82 points and 30 goals in 71 games with the Kootenay Ice in 2014-15.